This is the pride of the RDM. This becomes unique as it is the only 5th in the world of which the RDM, Rajkot is proud of having one. “Raj” is the name bestowed on to this master piece. Rocking Zebra “Raj” in his packing case with some of the toys kindly donated by children of Somerset schools getting ready for dispatch. Ragpicker Children’s smiles say a thousand words. This Rocking Zebra has been donated by the Rotary Club of Somerset Levels District 1200, England, by the International Chairman John C. Wood of this Club. The Rocking Zebra has a dimension of 6 * 4 *3 feet ( length, height & width ), This Rocking Zebra has been made out of steel & wood. It can take up weight up to 109 kilos. The Rocking Zebra is hand made by Simon Lane from materials purchased with fund raised by the children of Heathfield and Bisop Fox’s Community Schools in Taunton, Somerset in England. These children raised funds also in their own sweet manner. Their schools fine 50 pence to a child not wearing school uniform. These children decided not to wear their school uniforms and pay 50 pence each for this noble cause !! You got to be a child of show genuine concern with unconditional love for their fellow children across another continent who are underprivileged ! While packing the same for shipment to Rajkot, instead of using bubble bags or other packaging material, the children of Somerset have judiciously thought of packing it with environment friendly material. The children have donated more than 1200 of their nearly new soft cuddly toys. 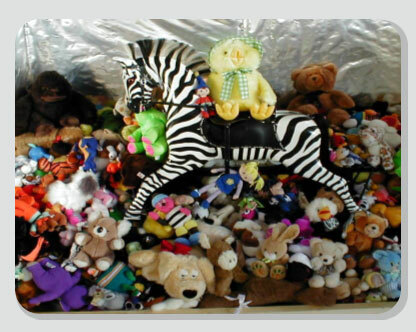 These toys have been used to pack around the Rocking Zebra for its added protection during the journey to Rajkot. It takes a simple effort but mighty determination, even by the school children to hand made and send such a marvelous piece of toy for the joy of the underprivileged fellow brethren somewhere far away in South Central Asian Country, India. We at the RDM, salute these children for bringing smiles of the faces of their brethren visiting and rocking happily in the RDM. Read the details of how and why this unique piece traveled to the RDM……Click to read on…. While Mr. John Wood was considering sending a doll to the Rajkot Midtown Dolls Museum, while searching the Internet his brother-in-law Simon Lane by accident came across a web-site about Rocking Horses. He sent off for the plans and then in the year 2000 made one for his two daughters. At the beginning of 2001 he decided it would be great fun to make a Rocking Zebra for the use of young children who had virtually nothing through no fault of their own. At the time, I was President of The Rotary Club of Somerset Levels and Simon asked me to help find a suitable location that could match his basic plan criteria. • To give enjoyment to as many children as possible. • For use by the children for as long a time as possible. Ensure that it is managed for the benefit of the children for at least 15 years. Members of my club looked at Nepal, Albania and South Africa but following our visit to deliver our Somerset doll to Rajkot Midtown for their Dolls Museum, the museum was selected by Simon as meeting his criteria and therefore the right destination for the Rocking Zebra. After a lot of work and numerous e-mails to Deepak the rocking zebra was named “Raj”. After receiving donations in kind by various local companies together with numerous soft toys donated by the members of The Rotary Club of Somerset Levels and children from ten local schools, our zebra was sent to Rajkot. “Raj“ arrived on 8 November 2003 and stayed packed until Simon arrived to officially present him to the Dolls Museum.